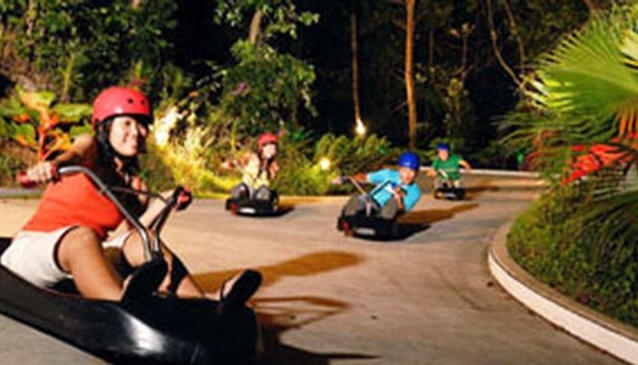 Part go-cart, part toboggan, the luge cart, can zoom down the hill on two different tracks: the gentle 650-metres Jungle Trail and the more challenging 688-metres Dragon Trail. With its safe braking and steering system, you are in control all times. You can beat speed or take it easy to gaze at the beautiful coastline of Sentosa and Singapore's skyline. Once the sun goes down, another adventure awaits you. Each track becomes a maneuvering trick. Plus, from the Skyride you'll love the amazing views of Singapore and the sparkle of the city night lights. Fun and excitement guaranteed! Watch out! You will love it and ask for more!